According to its heritage designation, Labatt Memorial Park (formerly Tecumseh Park) is “believed to be the oldest and most continually used baseball ground in the world,” having hosted its first game in May 1877. The land for the diamond, on the west bank of the Thames River, was purchased by local merchant W.J. Reid. 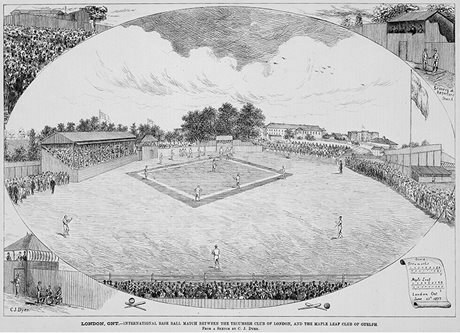 The park was originally named for the Tecumsehs who started to play there during the opening year in 1877. During that year, the London Tecumsehs played the Boston Red Stockings before a crowd of 8,000 people. The park was purchased by the Labatt family in 1936, who donated it to the city. The clubhouse, built in 1937, is one of the few remaining structures of its kind. The park also became home to the London Majors, who won the Intercounty title, the Ontario title, the Canadian title and the World Sandlot title in 1948. Labatt Memorial Park was designated under the Ontario Heritage Act in 1996. Watch the induction video for the London Tecumsehs on the London Sports Hall of Fame website. Learn more from a historical timeline on Labatt Park from the Tourism London website. Read more about this heritage-designated property on the Canada’s Historic Places website.